Many hotel websites put their phone number up in big bold letters, on every page of their site, to make it easy for potential guests to make reservations. The Stratosphere Hotel does the opposite, doing a pretty good job of hiding their phone number! It's not on their home page. There's no "Contact" link anywhere on the page. And, amazingly, even clicking "Reservations" doesn't show you a phone number! Neither does "Make a Reservation", or even "Inquire about a reservation". Incredible. We stayed elsewhere. The phone number is gone from the front page again. Even better, the phone number isn't even on their Contact page. Brilliant! The Stratosphere makes their number so hard to find, people actually come to our site by searching Google for "Stratosphere phone number". (Speaking of that, let me make it a little easier to find than even the Stratosphere does: Their reservations number is 800-99-TOWER. Anyway, when people leave your site and go to Google to find your retail phone number, that's when you know your site truly has a problem. Time-wasting Flash animation on the front page. Not only do you have to wait for it to load, if you go to another page and then hit the Back button, you get to wait for it to load again. Nice. Because of Flash, it's impossible to bookmark the Reservations page. Bait-and-switch. Clicking on "Specials & Packages" in the menu you see a deal that looks quite attractive: Sign up for their player's club ("Ultimate Rewards") and as part of the "New Member Bonus Program" get a package deal which includes a guest room or suite. My friend signed up, dutifully giving up all her personal info, but after signing up there was zero clue as to how to actually claim the advertised package deal. For example, in two separate incidents, guests were left dangling a sixth of a mile above the Las Vegas Strip when rides on the top of the tower unexpectedly shut down. This would be forgivable if the Stratosphere dealt with the situations responsibly, but they didn't. 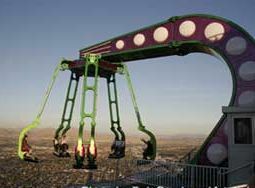 In April 2005, a month after the "Insanity" ride opened, an 18- and an 11-year-old girl were stranded on the ride, dangling 906 feet above the Strip for 80 minutes when the ride shut down because of high winds which reached 61 miles per hour. You would think the safest thing to do when the high winds start batting the ride around would be to bring the ride back in and let the riders get off the damn thing. You might think it would be more dangerous to leave them precariously hanging over the edge in super-high winds. But not according to the Stratosphere. A Stratosphere spokesman actually had the gall to say that the ride "worked exactly as it should." Wow. A more responsible company might apologize profusely and promise that in the future riders would be brought back promptly when there are high winds. But that's exactly what the Stratosphere did not do. It didn't end there. One of the riders, Erica McKinnon, said that workers in the booth were laughing at them while they were stuck out on the ride. And what kind of compensation did the Stratosphere offer the aggrieved riders? A free one-year pass for the ride! It's hard to think of a stupider response. You might think that after this experience, the Stratosphere would be better prepared the next time something like this happened and would handle it better. But no. Later that same year, six Japanese tourists were stranded on a different ride, X-Scream, for 90 minutes when the power went out. According to the news report, the ride was equipped with a manual override to bring the riders back in the event of a power outage, but a Strat spokesman "could not explain why the tourists weren't returned to safety until power came back on." Nice. Michael Shackleford, a well-known gambling mathematician and former university professor, says that the Stratosphere refused to honor an expired sports ticket. Though the ticket was expired, he says it's customary for Las Vegas sportsbooks to honor expired tickets anyway, and in fact knows of no cases in which they didn't. He says that the Strat is refusing to pay for no other reason than that they can. As a result, after running his website Wizard of Odds for 11 years, in 2008 the Strat became the first land casino to be named on his "Vegas blacklist".